Approximately 15 percent (47,000,000) of Americans rely on their own private drinking water supplies. The EPA regulates public water systems; but it does not have the authority to regulate private drinking water wells. Unlike public drinking water systems serving many people, they do not have experts regularly checking the water’s source and its quality before it is sent to the tap. These households must take special precautions to ensure the protection and maintenance of their drinking water supplies. Most of these supplies are not subject to EPA standards, although some state and local governments do set rules to protect users of these wells from contamination. The fundamentals of typical home well system consists of a drilled well, on average a well is about 200 feet deep (the deepest can be 1,000 feet or more) and has a steel casing that extends down quite some distance to prevent surface water infiltration and stop the well from possibly caving in. Some wells use a screen to let water in and to prevent sand and dirt from entering the well shaft. The area around the well is sealed with grout normally consisting of bentonite clay and gravel. In deeper wells a submersible pump is installed several feet off the bottom to pump water into the home. Shallow wells (typically less than 100 feet) use an above ground jet pump located in the basement or crawl space. Water from the aquifer is then pumped into a pressurized holding tank that stores water for use when the pump is not running and also serves to regulate the water pressure. From this distribution point the water is piped to the individual plumbing fixtures in the home. Water drawn from a well can contain many contaminates, most of these unwanted substances are not a health concern but can damage plumbing fixtures and eat away piping. Stains from untreated well water can ruin laundry, damage water using appliances, shorten the life of water heaters and clog pipes. Bad odors from well water can make a shower unbearable and can smell up the whole house. Modern treatment equipment has been designed to combat these atheistic water problems and can make a huge difference in the quality of domestic water supplies. Public Water in Maryland and the surrounding municipalities vary widely in the amount of hardness or calcium carbonate they contain. We have found water ranging from just a few grains per gallon to water in excess of 25 grains per gallon. The chlorine concentrations also vary greatly depending on the time of the year and distance from the water treatment facility. By law, the ph range of municipal water can only be between 6.5 – 8.5, but despite this the corrosive tendency of public water on copper piping is believed to be due to abnormally high oxygen levels. Most consumers will tend to favor Carbon pre filtration (for chlorine removal) and a Water Softener (for hardness removal) when they choose a whole house water conditioning system for their family. 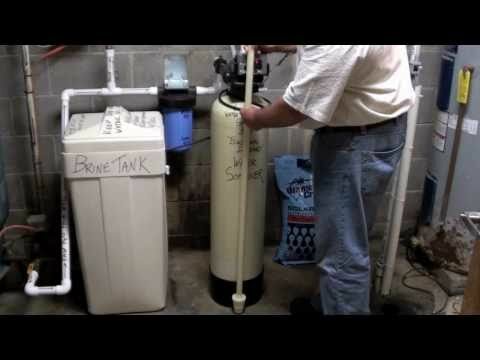 In addition to a whole house water filtration system, many consumers are also choosing to install a Reverse Osmosis System as an additional level of purification for drinking water: these systems have become very popular in recent years as a replacement for bulky and clumsy bottled water dispensers.